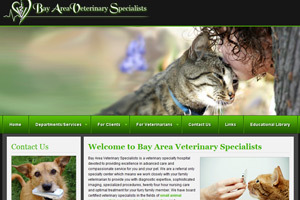 Big Splash Web Design created a veterinary website design for Bay Area Veterinary Specialists, a Houston area Animal Specialty Hospital. They needed a website that explained what services they offer to not only attracts referrals but also to highlight the differences between their practive and a standard veterinary hostpital. The design needed to highlight their logo and incorporate the multiple animal images in the header, which rotate through the use of jquery. A library of educational articles are also seamlessy incorporated into the website as well, using WordPress.